Welcome to a SECRET CINEMA event. OK you are suffering from deja vu. Cinestar have assured me that the projector is finally working.If the projector breaks down again we can gather around a laptop. 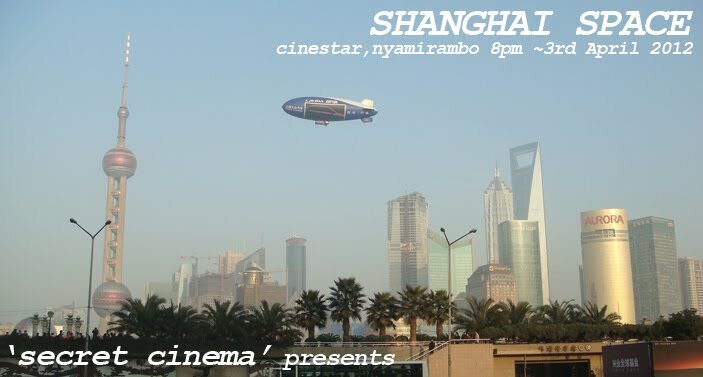 So with that.......we're back with the rescheduled screening of 'Shanghai space' We hope you'll join us again. We started with Cairo, looking at the disparties between the cities waste management plan and its increasing population. We then moved onto Mumbai , focusing on the cities choked transport network and the various actors which moved along with, inbetween and at the edges of the stifling flow of traffic. Shanghai will be the second last of this series titled 'Shanghai Space'. This will be shown on 8th May at 8pm , at CINESTAR cinema in Nyamirambo. (Running time is 60 minutes). The following week (15th May) I will screen the final of the series 'Bogotà Change' with a special suprise short screening from Beirut.